HowMechanismWorks ? : How A Break Boosters Works ? Why We Need It ? How A Break Boosters Works ? Why We Need It ? This is one of the most important functions of the vehicle as it is a safety provision that protects the driver and passengers. It is located at the back of the engine compartment on the driver’s side of the car. It help to improve braking performance and safety, the brake booster is an essential component of the braking system that helps allow accessibility to any driver regardless of strength or size. Reaction valve and a spring. It has two components where one keeps pressure at a constant level and the other varies the amount of pressure in the chamber. They are separated by a diaphragm. How Break Boosters Works ? When the hood is opened it seen as the round, black canister that's is called as Break booster.It provides effective braking as well as driver’s comfort in applying brakes.If we don't have brake booster, even the simple act of slowing your car would require substantially higher amounts of effort and incur greater amounts of fatigue. It contains a diaphragm that separates its interior into two parts, with both in a partial vacuum. As the brake pedal is depressed, it causes a valve inside the booster to open, which in turn allows air into one side of the booster. This difference in pressure on one side helps to push the piston inside the brake master cylinder forward in response to the brake pedal, which in turn slows and stops your vehicle. 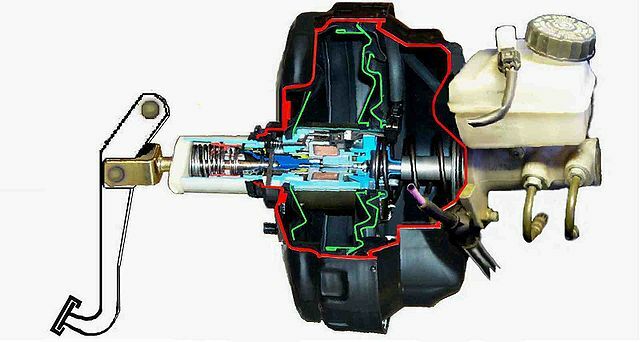 Why brake booster is required? The brake force applied by the driver on the brake pedal is not enough to provide enough braking force to stop or de-accelerate the vehicle, so there is a need of multiplying the force initially and this multiplication of force is done by brake booster to cause an effective braking. We need brake booster for smooth actuation of brakes. Brake booster is considered as the preventive braking measure taken to prevent driver and passengers as it decreases the chances of brake failure and also as it makes the braking more efficient and helps in case of panic braking. In case of high speed super and hyper car which goes over 250 miles per hour the use of brake booster becomes very essential as they requires high braking force to stop or de-accelerate the vehicle at such a high speed. In case of heavy vehicle as due to their heavy weight the brake force or frictional force required to stop or de-accelerate such vehicles is quite high, which can be fulfilled by the use of brake booster.